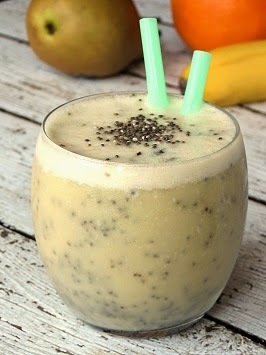 I love smoothies, especially banana, mango or peach ones! Just recently I discovered the health benefits of adding chia seeds to various foods. Most of the time, I don't even know that the chia seeds are in them! Here is some information about Chia seeds, their health benefits and a fabulous Banana Chia Seed Smoothie Recipe from Keren Gilbert. ** Recipe is courtesy of Keren Gilbert. Combine all ingredients in a blender until smooth, and enjoy! About Keren Gilbert MS, RD: Keren Gilbert is a nutritionist and the Founder and President of Decision Nutrition™, a nutrition consultant firm in Great Neck, NY and Roslyn, NY. Keren has years of experience in both clinical and private settings and has counseled patients with a variety of nutrition related issues including obesity, high cholesterol, diabetes, high blood pressure, pre natal, pregnancy and digestive issues. Keren is a registered dietitian and certified nutritionist in the state of New York. Keren completed her Masters degree in nutrition and food studies from New York University (NYU) and completed her dietetic residency at Mount Sinai Hospital in New York City. She is an accredited member of the American Diabetic Association and the Greater New York Dietetic Association. She is a member of Nutrition Entrepreneurs, Dietitians in Business, The Diabetes Care and Education Diabetic Practice Group and Sports, Cardiovascular, and Wellness Nutrition (SCAN). For more information visit www.decisionnutrition.com or visit Keren on Facebook at Decision Nutrition.